Correspondence between friends, letters between America and Denmark, news about family, work, and experiencs. And each letter included an embroidered triangle. 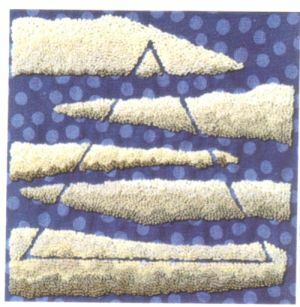 In 1996 we began creating small embroideries that present hand work as art compared to traditional craft, and we chose an equilateral triangel to illustrate this concept. The designs, materials, and techniques were chosen individually. Some triangles were finished in a matter of days, while others required several weeks. The triangles became a part of our correspondence to be read without words, strengthening our friendship. This exhibit shows a sample of our correspondence.